4. Read through the Eat Less Of sheet, and consciously commit to eating less of these foods for the next 30 days. If I could boil down my nutritional philosophy into two words, it would be “Nutrient Density!” By focusing on nutrient density you will achieve a healthy weight without any wacky dieting, for good. Nutrient density is the amount of nutrients a given food contains. Nutrients are things like essential amino acids, vitamins, phytonutrients, minerals, fiber and all around nutrition. Think of the food you eat as a large wallet, and the nutrition contained in the cell walls as cash. You want to deposit as much “cash” as possible into your “bank”. To illustrate nutrient density in action, let’s look at two dinners. One dinner has a grilled organic burger. 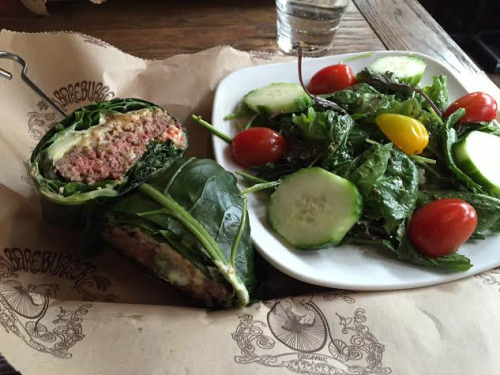 It’s wrapped in steamed collard greens, topped with mustard, avocado and tomato. It’s served with a side of baked sweet potato fries, and a tall glass of mineral water. The other dinner is a sad looking mystery-meat fast food burger. 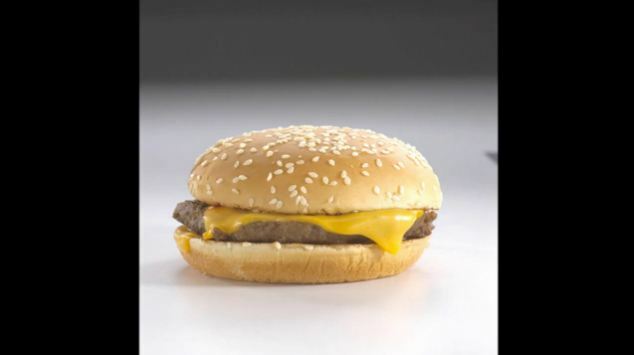 It’s served between a junky white bun, and topped with a neon yellow square of "cheese", a white piece of lettuce, and served with a side of made-from-frozen french fries cooked in year old vegetable oil. Oh, and it comes with a large “Diet” coke, that was made by dudes in labcoats. The first dinner contains a long, long list of nutrients: carotenoids, isoflavones, omega-3’s, calcium, magnesium, and on and on. The second dinner has such a meager amount of nutrients, it’s not even worth the energy it’ll take to digest it. Again, if you focus on eating foods with the highest nutrient values, that one action will eliminate the need for any other dieting for the rest of your life. Period. The purpose of eating is to give your body nutrients. Yes, food is supposed to taste great, and it can even be a bonding experience with loved ones. You can love to eat, and enjoy the food you eat. But the primary purpose of eating is to give your cells the vitamins, minerals, amino acids, and everything else that real food contains. Counting calories wasn’t necessary until all the packaged, junky, boxed, fast food was invented. That’s because junk food leaves you even hungrier than you were before you ate it. If you’re eating at McDonald’s, for example, you’re getting food that is packed with calories, but with very little nutrients. Your body spends energy to digest that food, and gets very little in return. Focusing on nutrient dense foods allows you the freedom to eat until you’re satisfied, and not have to count calories. These nutrients help you feel full, healthy, and mentally alert after you eat them. Eating nutrient dense foods can stave off the aging process, reduce your risk of age related diseases, and help you maintain a healthy weight effortlessly. There are countless studies supporting these facts. I know this list looks short, but the amount of foods that fit into these categories could take up at least five pages of text. Choosing the most nutrient dense foods in any given situation doesn’t necessarily mean that you’re eating like an angel 100% of the time, or cooking all your own meals. It just means you’re doing the best you can with what you have at any given moment. If you’re stuck in the middle of nowhere, and the only place to eat is McDonalds, choose the most nutrient dense thing from the menu. In this case, we’d go with a salad, and a maybe a side of oranges.